🎓 Awesome Ways To Learn Chinese: The Ultimate List of Mandarin Apps, Videos and More! 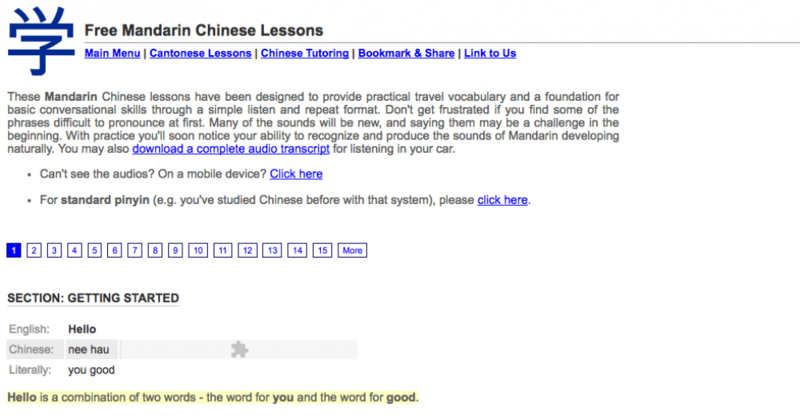 Awesome Ways To Learn Chinese: The Ultimate List of Mandarin Apps, Videos and More! Guess what former Miss Kansas 2013, Mark Zuckerberg and Oscar-winning actress Mira Sorvino all have in common? The title of this post may give you a slight inkling... yep, that’s right, they all speak Mandarin Chinese as a second language. Along with avocados and cryptocurrency, the popularity of the East Asian language has rocketed over the past 5 years, with more and more foreigners choosing to learn Chinese for business and tourism. With this surge came the surge in platforms offering services to learn Chinese - but which ones are actually worth it? We’ve been on a mission to find the best ways to learn Chinese, catering for all learning styles. The Chinese resources in our ultimate list complement one another, formal Mandarin education and Chinese tutoring. If you're looking to learn Chinese fast, the most efficient way is to find an online Chinese tutor near you. On revolutionary tutoring platform Tutorful you can find hundreds of great online Chinese tutors, read reviews and learn Mandarin in next to no time! We tried and tested many different tools to give you the ultimate list of apps to learn Chinese, Mandarin podcasts, Chinese learning videos, websites and much more! 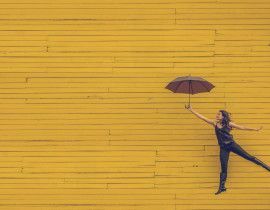 Some of the blogs and podcasts included will even give you that all-important cultural insight if you're interested in delving into eclectic Chinese culture and current affairs. If you want an easy and effective way to learn Mandarin Chinese, then HelloChinese is the app you need. Tailored specifically for beginners, HelloChinese is rated 4.8+ stars on both App Store and Google Play. It was featured by Apple in the homepage of App Store in over 70 countries and received overwhelmingly positive user feedback. LingoDeer is effective because it's created by real language teachers. 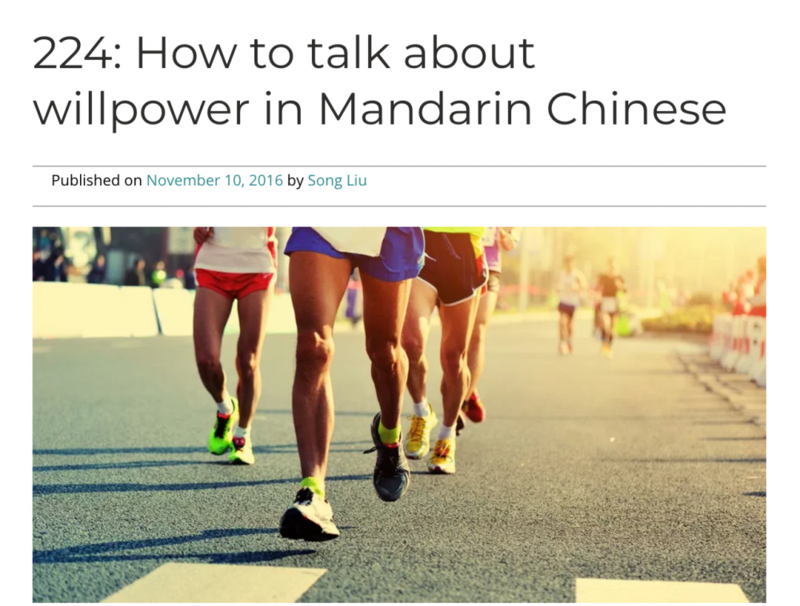 Every exercise builds upon the previous one, and teaches the fundamentals of the language quickly, making it ideal for total Chinese beginners. Teaching is a craft, not a simple program that throws a random mix of options to the user. LingoDeer is good pedagogy expressed through modern tech. 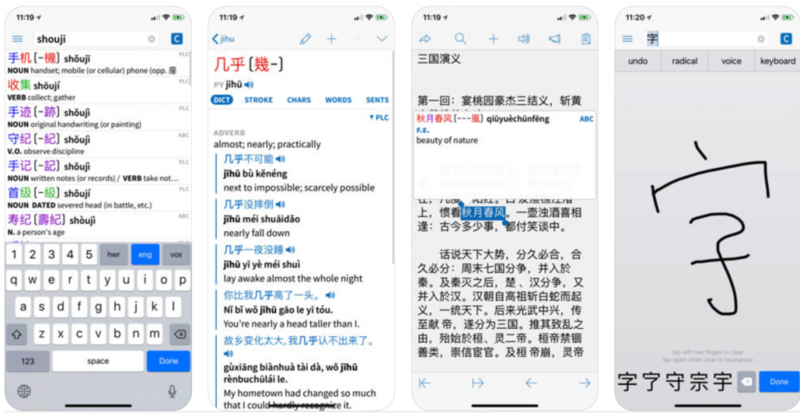 Pleco offers the most comprehensive selection of Chinese reference material of any single app - dozens of great dictionaries licensed from leading publishers like Oxford, Longman, FLTRP, and Commercial Press. They also offer a comprehensive set of Chinese learning tools to go with great content - handwriting, OCR, and speech input, a document reader feature to let you instantly look up words on web pages or e-books or within other apps, and a powerful SRS-based flashcard system. The Chinese language has the reputation of being one of the hardest languages to learn. 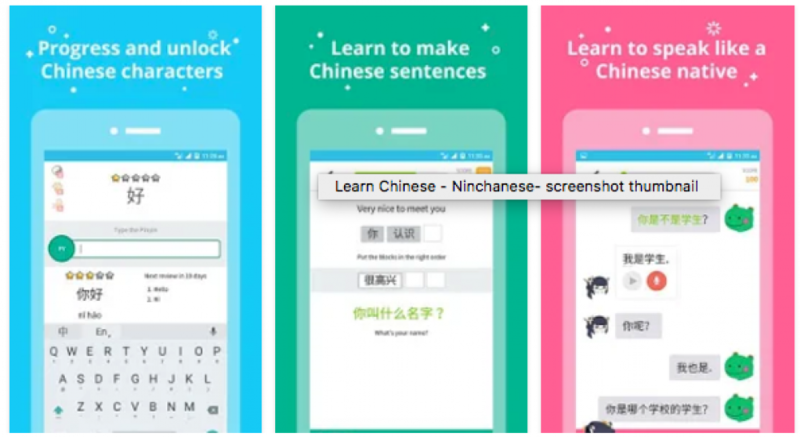 The team at Ninchanse understand that, and have developed their app accordingly to give to everyone the ability to understand and speak the Chinese language. The app is designed and developed with an SRS system especially to learn Chinese characters efficiently. Built with the help of Chinese teachers to elaborate hundreds of grammar exercises to understand in depth the Chinese grammar. With the added bonus of a fine-tuned voice recognition to get every tone right on any character. HelloTalk creates a safe environment to combine language learning with social interaction. The app's state of art communication tools — inbuilt translations, corrections, and voice messaging, amongst others— facilitate language exchange between users. The vibrant language community spans all cultures worldwide, and with nearly 10 million people using the app, any learner can find an exchange partner on HelloTalk. A blend of a education and social media, we enable every learner to talk to the world. The idea of Speaky is to connect people from all over the world and enable them to practice a language through real conversations with native speakers. 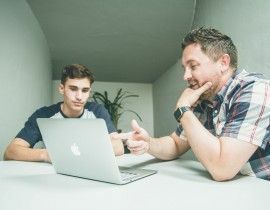 Conversing with native speakers is crucial for learning languages, but unfortunately is missing from most language courses, and not mention the school curriculum. Speaky recognises the importance of language exchange and brings it directly to you. No matter what the language, practicing with Speaky helps to develop active communication skills in that language and strengthen self-confidence when using it, which is a must, to become fluent! Du Chinese is a highly rated reading app for learners of Chinese and is available for both iOS and Android. The app has hundreds of lessons of varying difficulty, with new content being added continuously. Each lesson has built-in voice recordings and translations, making it a great replacement for a traditional textbook. The reading interface is super intuitive, to let the student focus solely on reading without distractions. This helps students improve their Chinese reading and listening skills at a fast pace, and makes studying Chinese fun. Zizzle has an incomparably unique and fresh approach to making Chinese characters stick in your memory. Chinese characters pose a special challenge, the use of engaging visuals and humorous stories make learning accessible to everyone! The stories might seem silly sometimes, but that’s exactly the point! The app really focuses on the best ways to learn Chinese, it combines such mnemonics with more conventional Chinese learning approaches, such as spaced repetition and an intelligent quiz system. To keep their edge and to ensure the quality of content, the team are continually designing every single story and have multiple people read them to make sure they are effective. 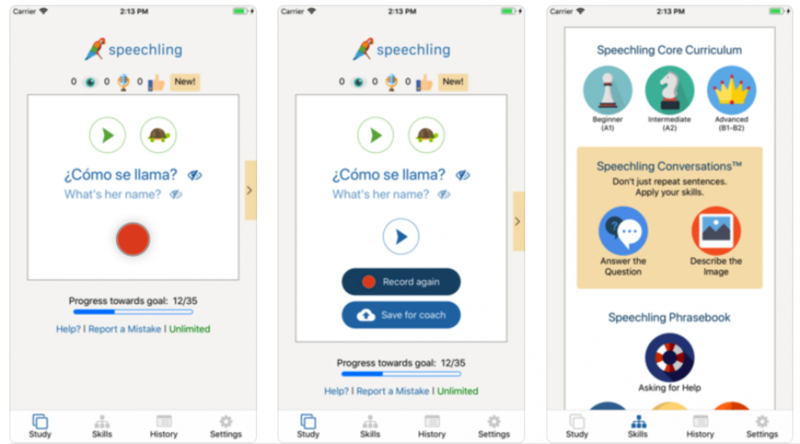 Speechling is a nonprofit mobile/web language learning platform that combines human coaching with technology to improve any language learner's speaking. The app gives free and affordable language coaching from certified language coaches. The platform provides many other language learning tools for the community free of charge. They have thousands of monthly active users, as well as multiple schools, and businesses using the service - so trust us that you'll get plenty of value from the app! We love that the company values social impact as well; they established a scholarship in late 2017, which has enabled low-income language learners to do achieve their dreams, from volunteering as an English teacher in Africa to applying to a neonatology medical residency in the United States. 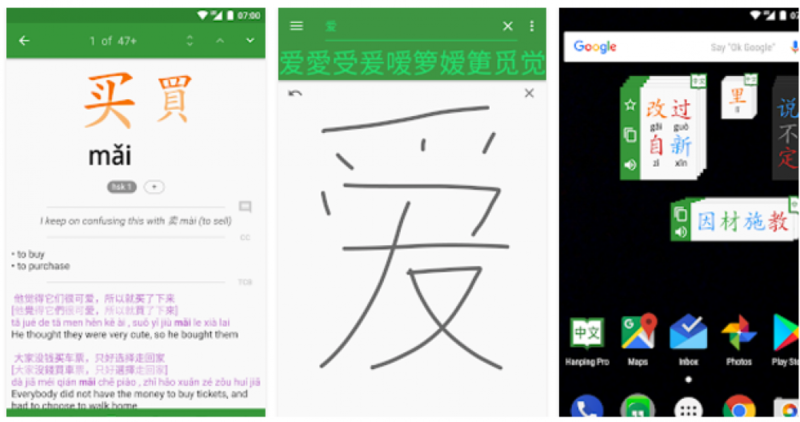 Hanping Chinese is a suite of Mandarin & Cantonese offline language-learning apps for Android, that includes a dictionary, handwriting recognition, OCR (text recognition in images), high-quality native speaker audio (single-syllable and multi-syllable), clipboard monitoring and much more. We can certainly understand why their pro dictionary app it is so well rated to support Mandarin learning! 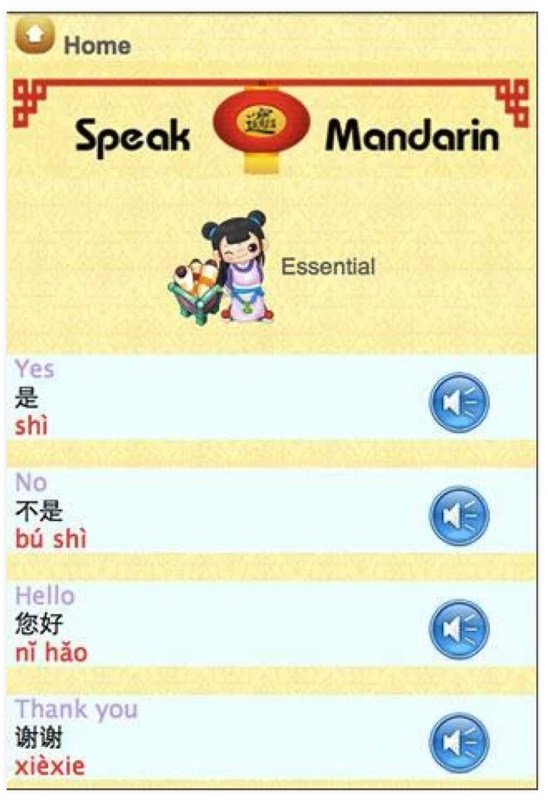 The Standard Mandarin app provides straight-to-the-point instructions with audio, text and visual animations allowing students to precisely pronounce the distinct sounds in Mandarin Chinese. 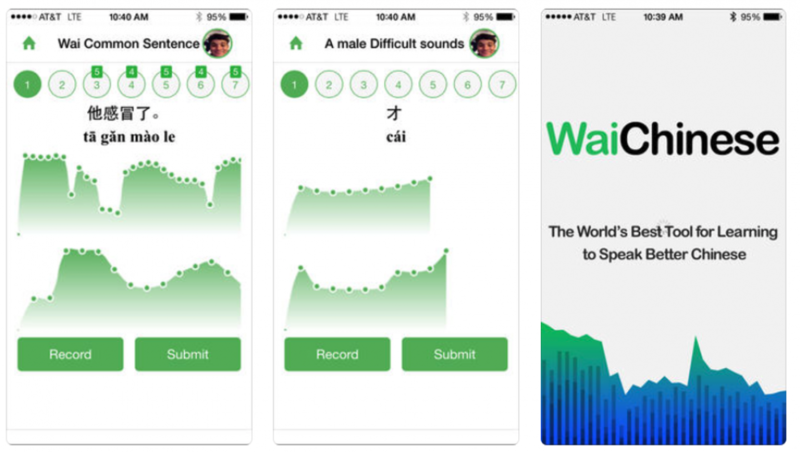 This app is specialised on the one biggest obstacles for Chinese learners - pronunciation. The app helps the student cut corners by not only providing the audio files, but also concise descriptions in plain English on how to produce the sounds. 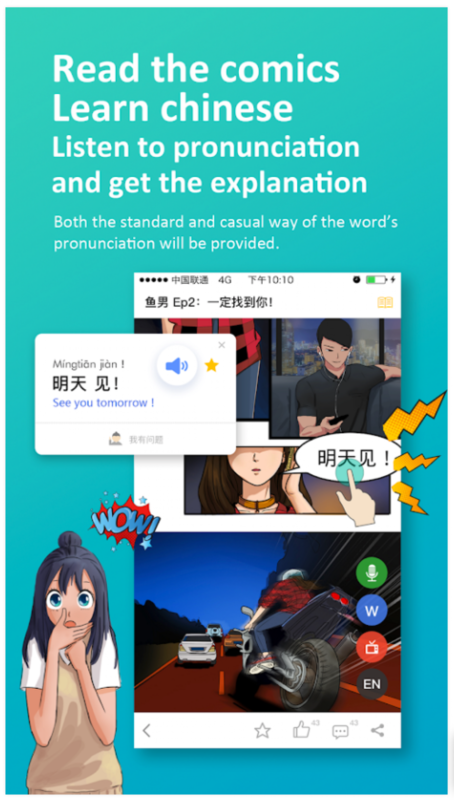 There is no need to be a linguist to use this app, any Chinese beginner student will be able to get clearer and more distinct Chinese pronunciation. Using Skritter is about more than just memorising characters for your next daily quiz, the app helps make them stick in your memory forever! Skritter works, because rather than mindlessly tracing characters by writing them hundreds of times in tiny boxes on paper, you practice writing using active memory recall, and you can do it on your phone! Skritter is built by a team of Chinese and Japanese learners who understand the needs of a student. 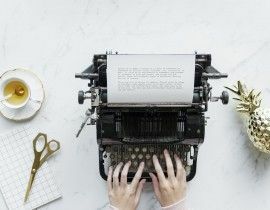 They harness the power of spaced repetition to ensure that you're always focused on the things you're struggling with most, whilst still learning new vocabulary every day. The app features hundreds of textbooks, and a library of tens of thousands of vocabulary entries, which makes custom list making a breeze. Forget flashcards, and use Skritter, so you can focus on the more essential things in life, like mastering Chinese! A great app to quickly learn expressions that can be used whilst traveling in China. With 400 expressions, plenty of situations are covered for your journey. The trio of audio, illustration, and text (in your language, in Chinese and in phonetics) makes it easy for learners to progress quickly. Founded in 2005, Chinesepod has skilfully crafted more than 4500 enjoyable and unique Mandarin Chinese Lessons. 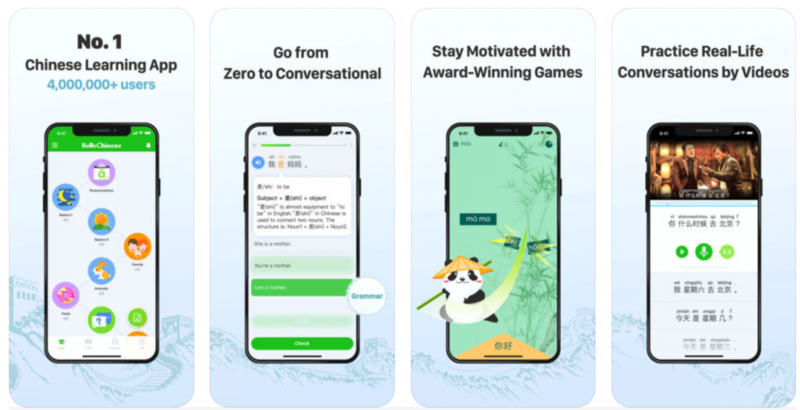 You’ll stay motivated to learn Mandarin Chinese by staying connected with The Chinesepod App. Structure based on your knowledge level: Newbie, Elementary, Intermediate, Upper-Intermediate, and Advanced The ChinesePod App serves as your online guide to learn Mandarin Chinese On-The-Go. Included in the free app and a paid subscription, we've got everything a Chinese language learner needs, like a dictionary with lessons and examples, Pin Yin, Say It Right Series and flashcards. We even have detailed HSK prep for levels 1 - 5, for those studying to pass the official Chinese language test. Once you download The ChinesePod App, you’ll see you have access to THOUSANDS of downloadable audio and video lessons. Each lesson is complete with a fluent speaker who explains clearly proper grammar, Chinese characters, and common Chinese expressions. Nearly a million people have used ChinesePod's fun, real-life situations to learn and enjoy learning Mandarin Chinese, and with the Android or IOS app, so can you! An inspiring app making your Chinese learning journey fun and effective. Get free articles on a daily basis, written specifically for beginners and intermediate Chinese language learners. Each article comes with intuitive tools that make understanding swifter than ever. You'll find an instant dictionary and Chinese audio along with listening and reading practice for a guided personal experience. 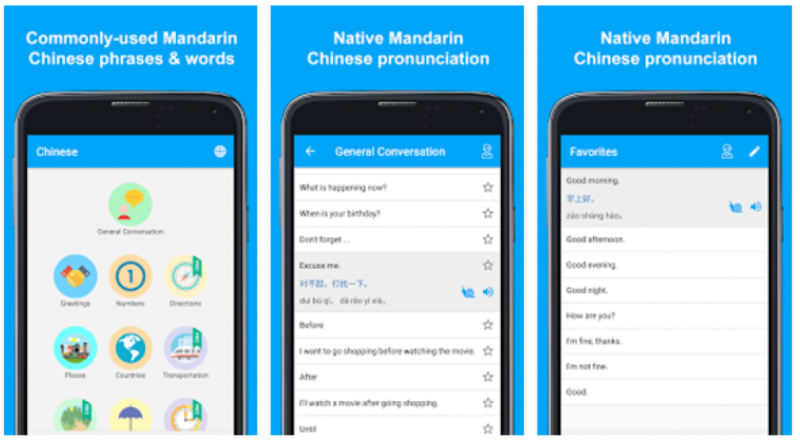 An awesome app that utilises one of the most effective forms of language learning - speaking to native Chinese speakers. Simply press the call button, and connect with someone who will help you learn and practice immediately. Once the conversation has ended, you'll be greeted with feedback about grammar, pronunciation, and fluency so you can easily track your progress. Flashcard apps can be one of the most effective ways to make the most of your study time. 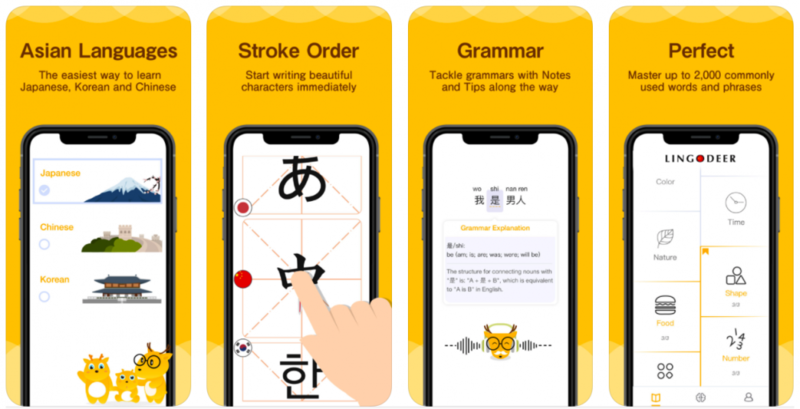 This app is particularly great as it uses an awesome form of Spaced Repetition and artificial intelligence so you can learn lots of Chinese characters in a short space of time, based around your exact learning needs. If you've made a start on learning Chinese, but haven't quite managed to gain the confidence to speak it - this app will suit you perfectly. Advanced voice recognition technology is incorporated into the app, so it can cleverly rate your pronunciation and intonation in real time - your very own hand-held training partner! Learn Chinese-Hello HSK is an awesome series of apps developed by the expert HSChinese team. The series includes levels 1 through 6 and doesn't just provide Chinese teaching materials for learners, but also the opportunity to consult Chinese teachers at any time in the app. The Written Chinese Dictionary app is packed with a wealth of free tools for beginners up through advanced students. It is a must-have app to go along with any Chinese learning course. Not only does it support a Chinese-Pinyin-English word search but also includes a flashcard study system and allows users to set their own learning goals. Each Chinese character has a full details page that includes audio pronunciation, stroke animations to help users learn how to write, as well as useful, everyday example sentences. Users can study Chinese with ease on their mobile or desktop device, anytime, anywhere. 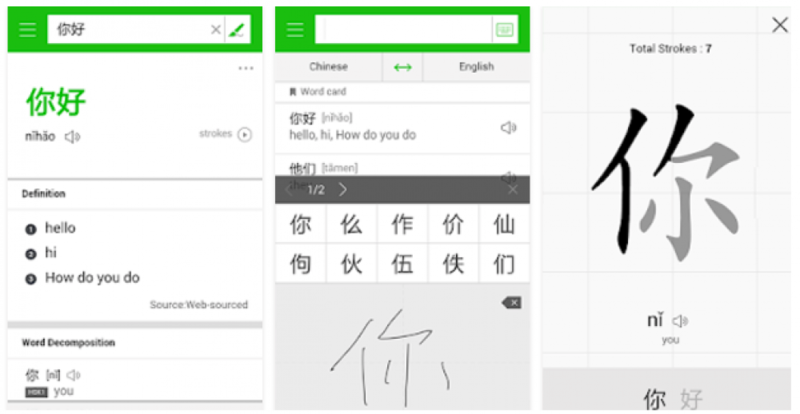 Fast and easy search makes this app ideal for learning Chinese on the go. Online and offline functionality and detailed definitions give this app an edge over other Chinese dictionaries. It's difficult to be confident speaking a language whilst learning, and we've found that this is especially tricky with Mandarin! Waichinese will help build your confidence by letting you listen to, speak, and get feedback on your Mandarin whenever you need it. Learn Chinese and have fun at the same time! 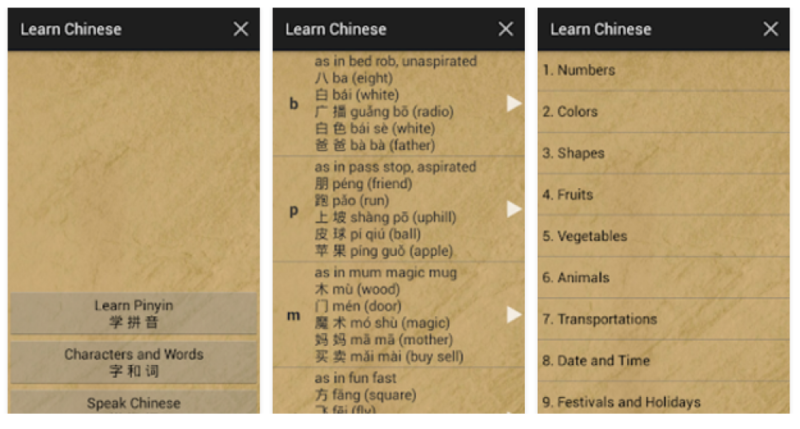 The app is jam-packed with features to help you learn Chinese characters and pronunciation. Track your own learning journey and plan your revision by saving characters to “Favourites” and creating a user customised lesson. Learn 2000+ of Chinese Mandarin's most commonly used words and phrases. According to the great team at 123Lingo, you'll be able to start speaking within 10 minutes with native Mandarin pronunciation - we're impressed! 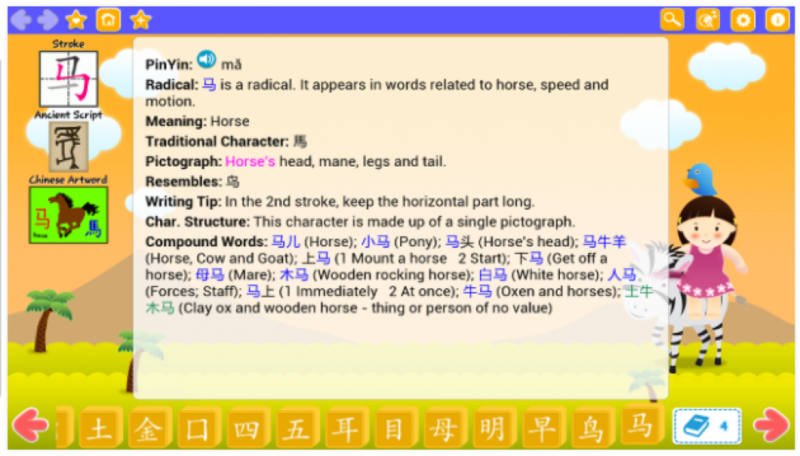 You'll find thousands of vocabulary lists, recordings, character animations and awesome Chinese character flashcard training on this app enabling you to learn Chinese fast! 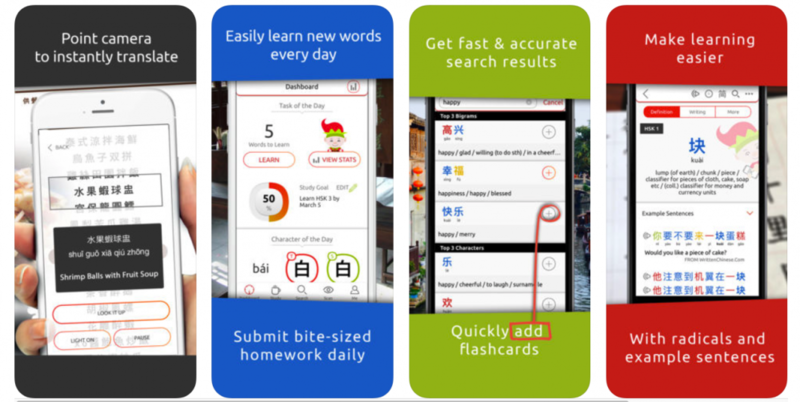 This free app is a perfectly simple companion to your Chinese language learning, giving you all the tools for your daily practice schedule. This is one awesome way to learn Chinese if you love all things anime! The Manga Mandarin app enables you to become fluent whilst reading comics tailored to your learning. As an international team of Chinese comic artists, teachers, and Chinese learners, they create long-term serial comics with various styles and stories. 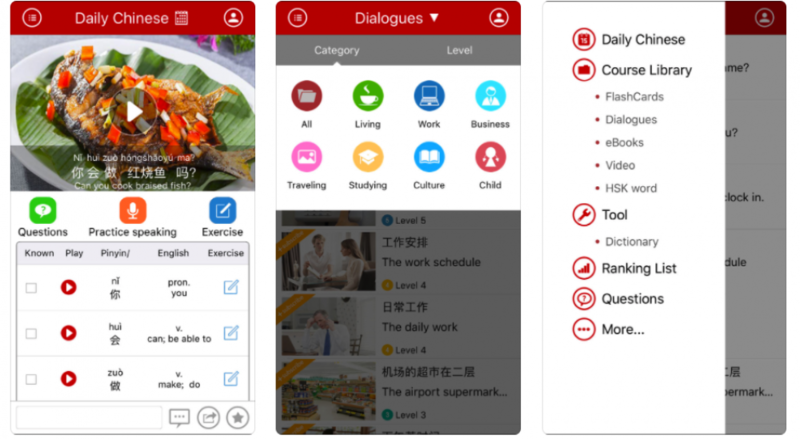 The intuitive app includes 77 Mandarin Chinese lessons, covering thousands of words and phrases used on a daily basis - both for travelling and day to day life. With clear audio, you'll pick up speaking and understanding the language in no time. Chinese grammar is explained through logical, professional and unforgettable videos which will make your Chinese learning process much easier and faster. The team behind the videos believe that just learning properly and efficiently is fun by itself, without any gimmicks. The Chinese courses also meet the requirements of the HSK test, so they can be used for your preparation and revision! 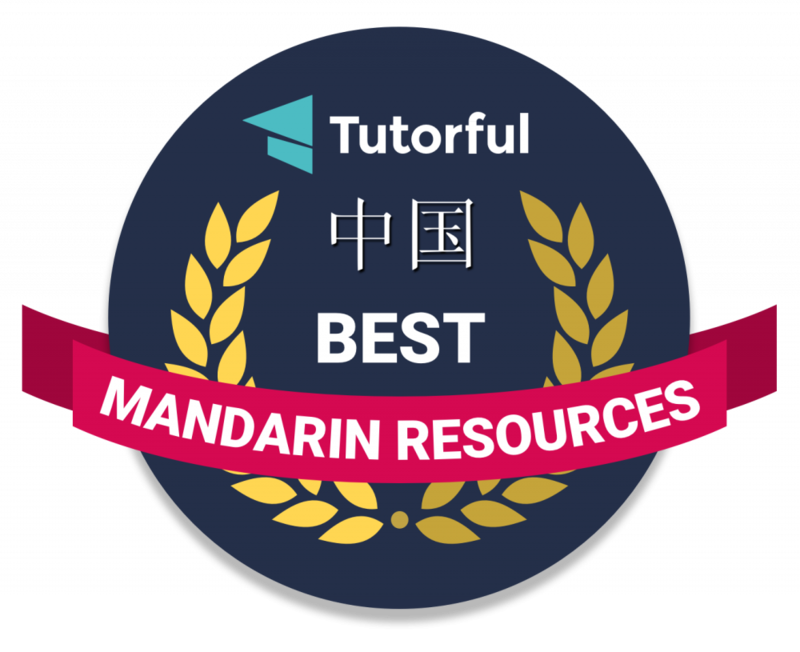 Fluent in Mandarin is an online Mandarin Chinese learning platform with more than 150 videos, 30,000 subscribers and 2.5 million video views. Chris started the channel and the site to share his experience as a British person learning Chinese with the goal of 'making Chinese easier to understand'. In his early videos, Chris outlines how he learned Chinese to fluency, including the resources, tips, and techniques he used. More recently, he has created videos explaining some of the most complex and difficult to understand aspects of Chinese in the simplest way possible - including aspects of Chinese characters and grammar. Recent popular videos include 'Chinese History in 20 Minutes', 'Basics of Chinese Grammar Explained in 10 Minutes' and 'How to Remember the Tones in Chinese, Forever'. Yangyang started teaching Chinese 10 years ago following a job as an entertainment TV host. She teaches from an English speaker’s point of view, helping students break through common roadblocks they usually face as beginners. 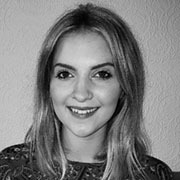 We love her teaching style as her passion really shines through in the videos! 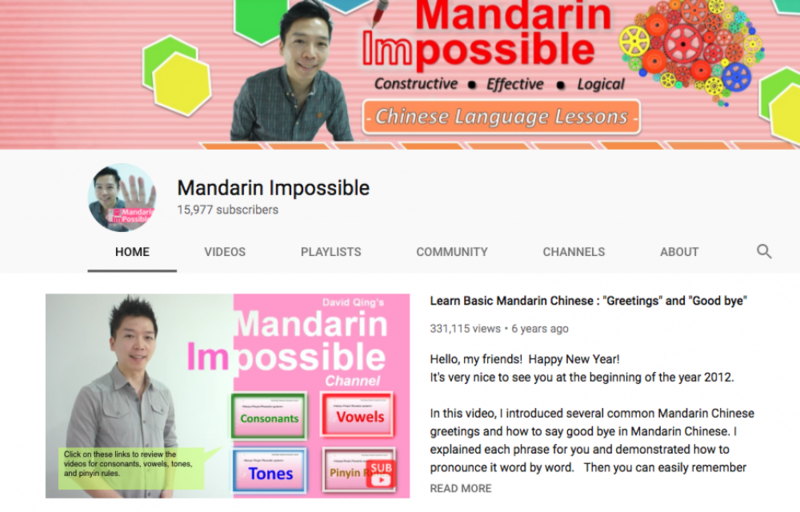 All the videos on the channel are put together by David Quing, a wise mandarin teacher on a mission to help everyone learn the Chinese language. The illustrations and character animations coupled with his effective teaching style make these videos ideal revision material. Okay, so these aren't really your conventional Chinese learning videos - but they are an absolute breath of fresh air if you've been plowing through mundane language learning resources. 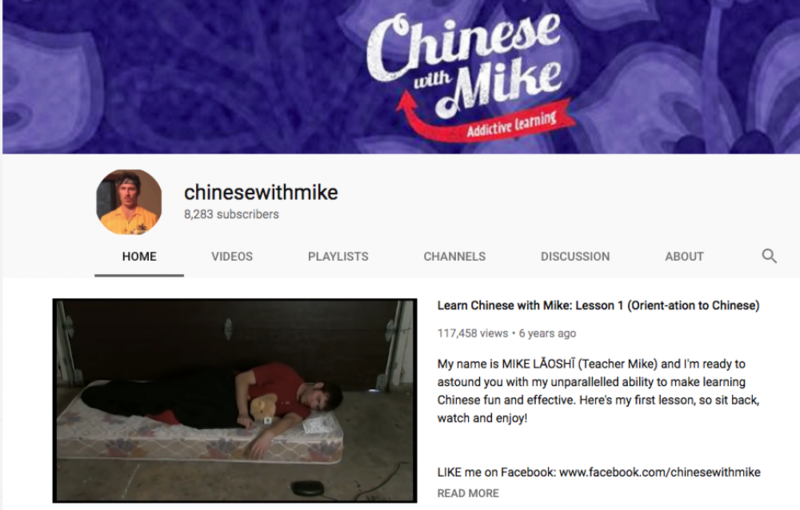 Mike Laoshi teaches Mandarin with a pleasant dose of humour, in a way that makes the language accessible to everyone. He'll be your new go-to mandarin tutor - especially when you need a good giggle or two. Jasmine is a half Polish-half Chinese student living in Melbourne, Australia. Her channel is full of useful language learning tips, as well as lifestyle, travel advice and health and wellbeing videos. Glossika focuses on speaking and listening fluency. This is especially helpful for languages with complex writing systems, as you can learn to hold conversations before mastering the script. Glossika uses machine learning to sort complex speech patterns giving students a more effective path to fluency. Hacking Chinese focuses on the best way to learn Chinese. Mandarin is a language very different from English and comes with a number of challenges that are absent in most other languages (such as tones and Chinese characters). Almost eight years and 400+ articles later, there are articles covering most of the questions students (and teachers) ask about learning Mandarin. All these articles are available for free, as well as a handy resource section with over 400 resources sorted and tagged by proficiency level and type: Hacking Chinese Resources. There's also a challenge page where people can sign up for challenges (twice per month) to track their own progress and compete with others, or against themselves: Hacking Chinese Challenges. Both these services are completely free. 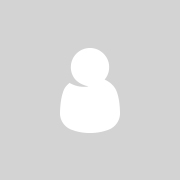 A wonderful question and answer site, that should be your first choice when looking for Mandarin language forums online. Ideal for students, teachers, tutors and linguists wanting to discuss finer details of the Chinese language and become acquainted with more specific language use in context. 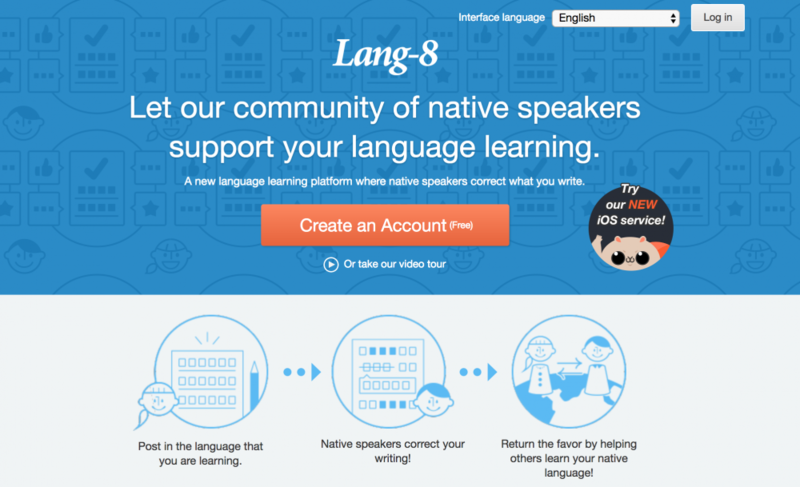 A great concept for a website, and a great companion for anyone learning a language. Simply post in the Mandarin, and wait for native speakers correct your writing! You can even return the favour by helping others learn your native language, for a truly immersive learning journey. With native speakers over 90 languages to study, finding a language partner has been made super easy! Utilising a progressive approach is one of the best ways to learn Chinese. This website uses this approach, where each new phrase builds upon the vocabulary already learned. The intuitive system continually reinforces your language skills and vocab knowledge and speeds up memorisation! An uber awesome chrome extension to guide you through understanding words in Chinese. Simply click words or phrases on any site to translate them and practice them with flashcards. All the words you translate through the extension are saved so you can practice them on the dedicated Flashcards Page whenever and wherever you want! Your free, comprehensive and practical online resource for Chinese grammar, with over 1,930 articles and more added every day! Hugh started the blog in the second year of his East Asian Studies degree at university. You'll find a plethora of interesting articles on the site including an array of translations of various original texts from East Asia, explanations of a variety of things from grammar to software, commentary on current events, arguments and debates and other random anecdotes. We love it, and we know you will too! Located in the beautiful southern city of Guilin and officially affiliated with Guangxi Normal University, CLI offers intensive Mandarin, College Study Abroad, China Seminar, and online one-on-one program options. We believe that practicing Chinese is important, but it's difficult to know the best way to make it work for you. We recommend signing up for this friendly community, a great place to share and find the best resources and advice for learning Chinese for free. Listening to the language can be one of the best ways to acquire confident Mandarin skills. 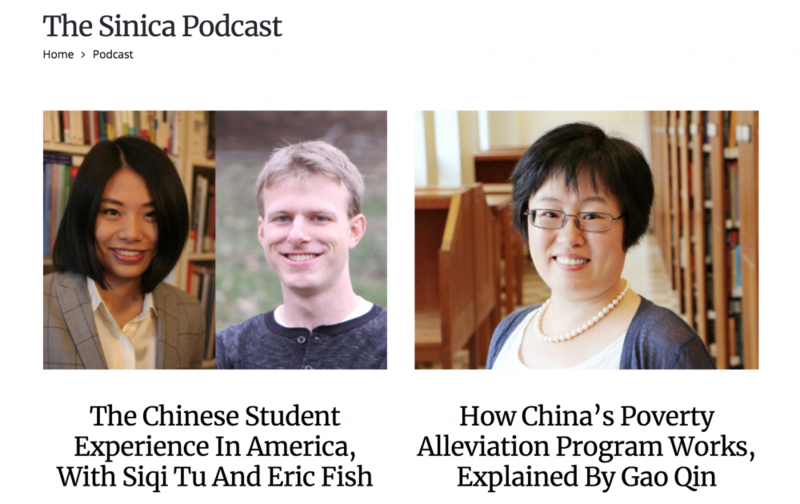 This series of podcasts wonderfully introduces key Chinese words and phrases to practice along side your Chinese grammar education. A hectic lifestyle doesn't have to stop you from learning a new skill. Melnyks Chinese audio lessons allow you to tailor your learning to your personal schedule, so you can learn at your own pace, anywhere that is convenient for you. What's more, each audio lesson comes with PDF transcripts, a worksheet, and additional situational dialogues. Chinese Learn Online (CLO) has been around for more than 10 years and is a popular resource for Chinese learners, especially beginners, as it is listening based. Understanding the tones in Chinese is one of the hardest parts of learning the language, so it is important to get your brain used to the different sounds by introducing a variety of tones. Ideally the best source of listening material is material that is just slightly above your comprehension level. If it is too easy, you won't be learning anything, and if it's too difficult your brain starts to ignore what it's hearing. CLO tries to provide listening material at just the right level by using a progressive method. 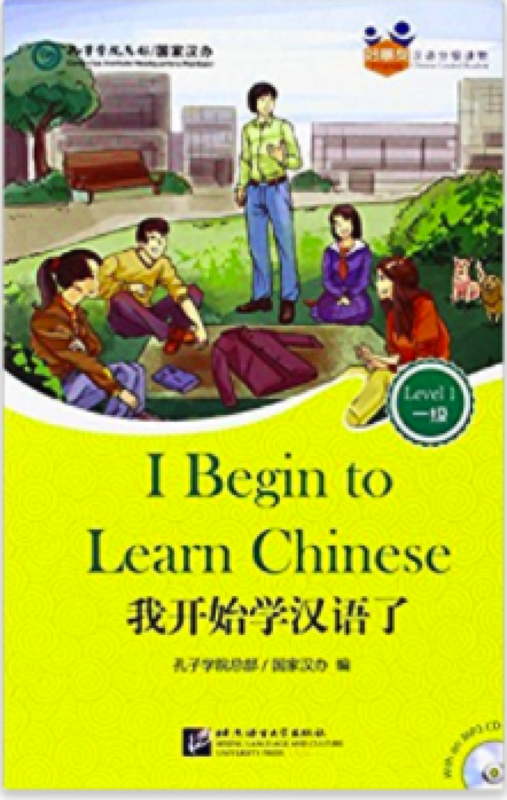 The Each lesson adds a few words of Chinese and builds up where the previous one left off. If you're learning mandarin, you've probably already adopted an interest in Chinese culture and current affairs. In fact, this kind of knowledge can often provide great context to your language learning. This weekly discussion is revolved around all things Chinese current affairs, hosted by dynamic duo Kaiser Kuo and Jeremy Goldkorn. Originally focussed on story lessons for intermediate learners, “听故事学中文” is a growing platform for all those interested in learning Mandarin Chinese through classic and popular stories of Chinese culture. A fascinating and authentic concept that has been proven to be one of the best ways to learn Chinese. We particularly love that the podcast has an explanation session with a variety of recap and repetitions to aid practice. This Mandarin Chinese dictionary covers the 1,500 most useful Mandarin Chinese words and sentences. Each word and sentence is given in Chinese characters with Hanyu Pinyin pronunciation and English definition. The words are grouped into 38 themes or topics. Each theme has 25 to 35 words and 5 to 8 sentences and is richly illustrated with colour photographs. Includes online companion audio recordings by native Mandarin speakers of all the vocabulary and sentences. A brief introduction to Chinese pronunciation and tones is included, and indexes at the back allow you to quickly look up any of the words or characters in the book. 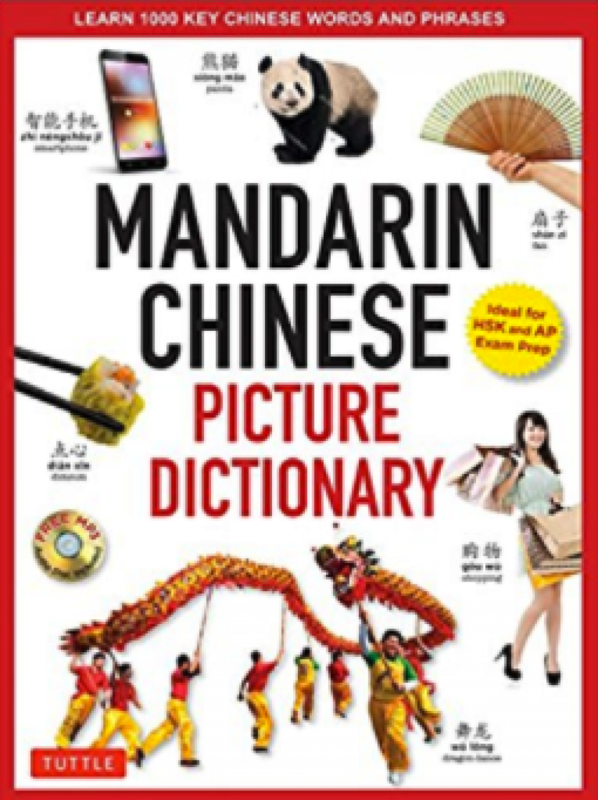 Since this dictionary covers all the words for the AP Chinese Language and Culture Exam as well as the Chinese HSK Levels 1 & 2, it is an ideal test prep resource for a visual learner. 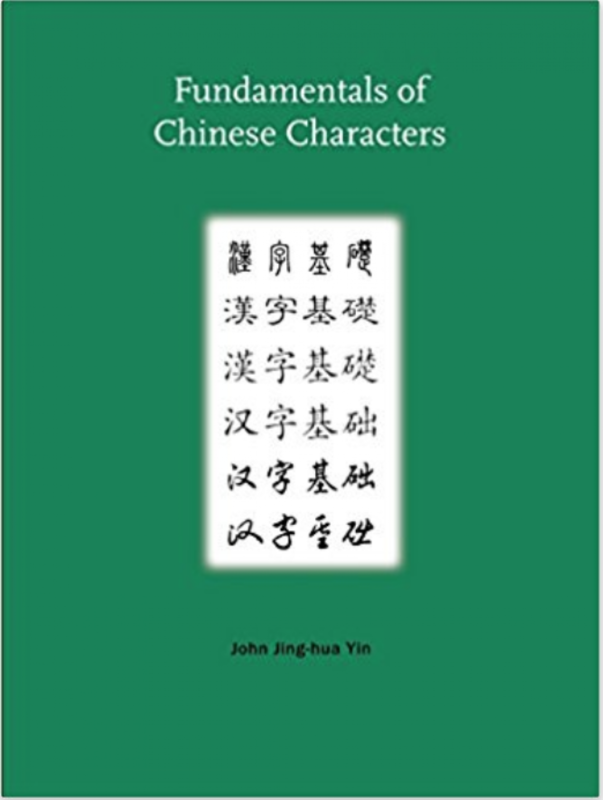 Fundamentals of Chinese Characters looks at the fascinating connections between the shapes and meanings of basic Chinese characters. This allows you to recognize and write the intricate characters whilst, or even before, you learn to speak the language. With interactive exercises, illustrations and rhymes for all the characters covered in the book, this has certainly become one of our favourite ways to learn Chinese characters. Chineasy believes in playful learning, immersing play with thoughtfully planned learning objectives. With Chineasy Tiles, the magic happens when children get creative and have fun. We designed our games to foster new ideas and experiences for kids, and reinforce social, emotional, and developmental skills. There are more than 20 ways to play Chineasy Tiles. 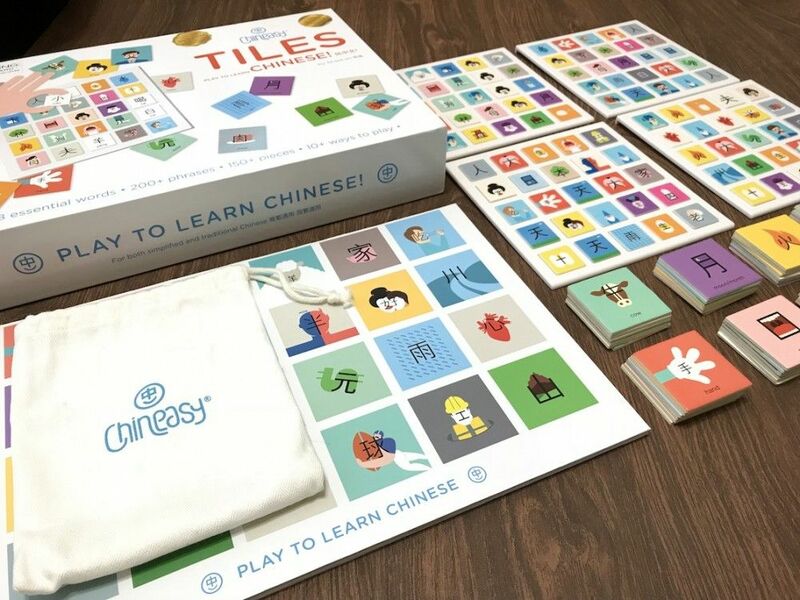 All of our games facilitate Chinese learning through associative techniques, cultural context, and language awareness. Different game methods focus on action, concentration, flexibility or problem solving skills. The more the merrier! Chineasy Tiles is great for playing in groups. Children learn to work together, think creatively, communicate, reason and present findings. Let their imagination run wild through storytelling, charades, and action-packed games with Chineasy Tiles! One of the most tedious aspects of learning a language is memorising vocabulary - this website is focused on Mandarin vocabulary learning through addictive games. You'll find games to help you learn more than 5000 Chinese words in pinyin and characters from basic levels (HSK1) to expert levels (HSK6). 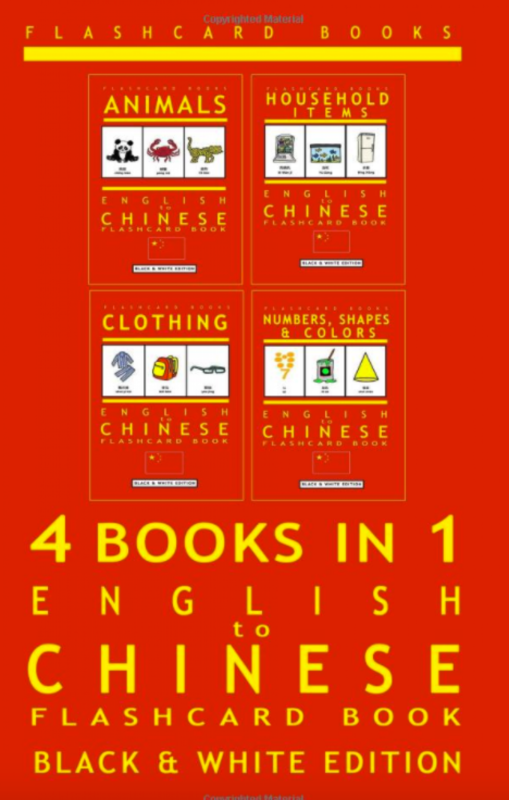 The book is written for adults learning Chinese who have already learned 150 words corresponding to New HSK Level 1, a simple but effective resource for teachers or tutors to use alongside lessons. 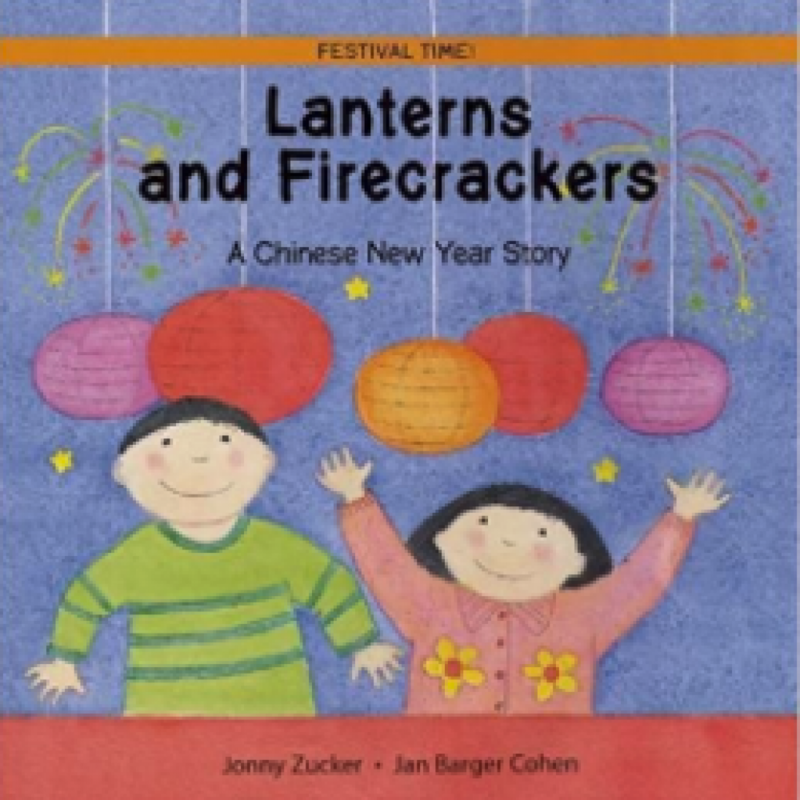 The book integrates diverse situations to cultivate student's cross-cultural perspectives. The books provide a fun break from more intensive learning materials and can be a great way to introduce your child to basic vocabulary without overwhelming them. Each page contains a simple illustration and one word to learn. The Flashcard Book and Ebook series are essentially a set of flashcards in book form, designed to expand vocabulary for students aged 4 and up. Each book covers a different topic including, Animals, Household items, Numbers shapes, and colours. Available in Chinese/Mandarin and a wide selection of other languages. Created by Shanghai-born NYC mom, Toni Wang, Chinese Children's Classics v 1.0 is a first-of-its-kind collection of classic Chinese children’s songs updated with a fresh new sound and voice. The album's 15 tracks fuse rock, pop, electronica, dance, ska, and hip-hop influences with playful lyrics to make it not only a fun and engaging experience but also a unique, quintessential educational tool. Children will enjoy this music and be excited to learn about Chinese language and culture! 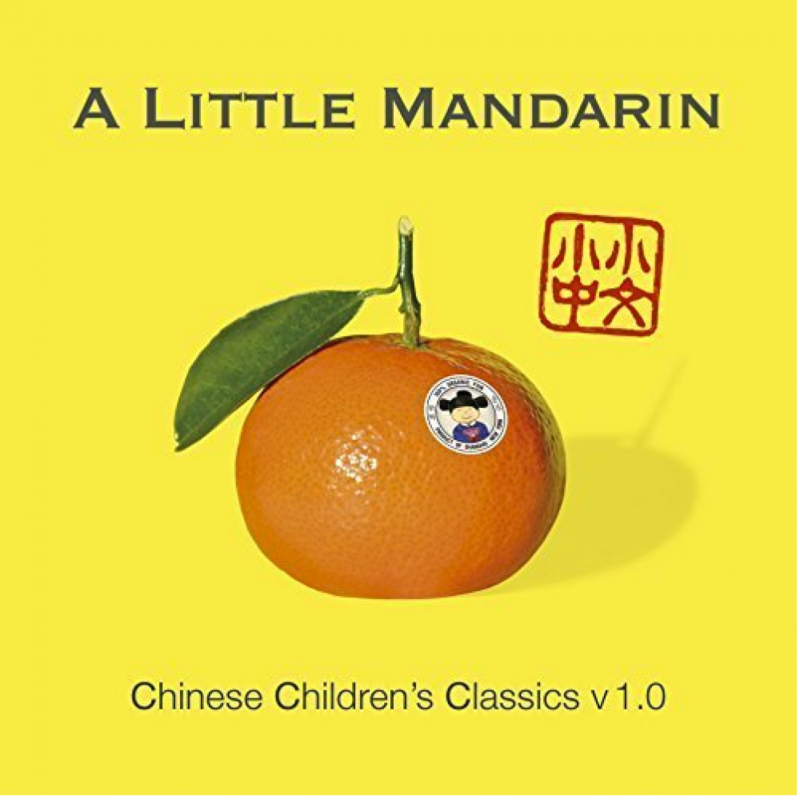 A winner of Dr. Toy's Best Classic, Creative Choice CD of the Year and Parents’ Choice Silver Honor, this album is lauded by leading cultural and educational organizations including Asia Society's Partnership for Global Learning/Chinese Language Initiatives, China Institute (NY), Mandarin Institute (SF), Chinese American International School (SF) and Mandarin Stars (Australia). This superb set makes learning Chinese for children interactive and thoroughly enjoyable. Each of the 32 blocks included reveals a debossed Mandarin Chinese character representing the word for an animal. On its opposing side, find the same character paired with its English translation. See a handcrafted picture of the animal on yet another side. If you have a family that loves learning, you'll want to keep hold of these for many generations to come! Little Fox creates highly engaging, level-appropriate animated stories to make learning languages fun. The award-winning content keeps learners interested and helps them build vocabulary and fluency in a natural and authentic way, with plenty of opportunities to listen to, speak, and experience language. 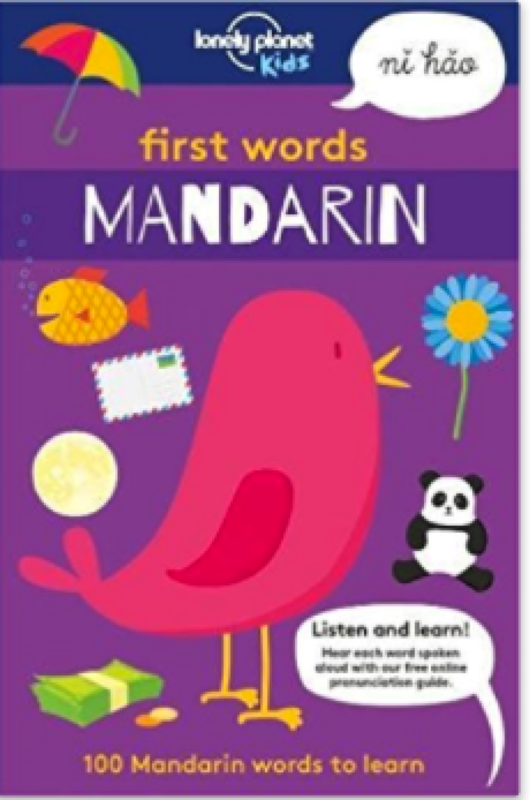 Miss Panda Chinese-Mandarin Chinese for Children is a Chinese language and culture teaching resource for parents and educators. They engage young learners with playful learning, comprehensible input, and stories to proficiency. We love the expert & author interviews as they empower parents and educators - expanding Chinese language and culture teaching to cross-culture understanding and world culture. The app is designed for kids aged 7 - 15 who are learning Mandarin but have nowhere to get hands-on practice. Their goal is to eliminate the barriers to language learning and provide the best quality communication platform for them to experience Chinese culture while improving their language skills. Kids Chinese Podcast is designed for kids, teenagers and adults to learn Mandarin Chinese. The Chinese lessons help you to learn Chinese listening and speaking via podcast/audio/video, and Chinese reading and writing via video, podcast lesson transcriptions, exercise worksheet, online exercises, and quizzes. Lessons' topics are designed using practical dialogs starting with focusing on kids’ daily life, while you receive systematic training on Chinese listening, speaking, reading and writing. Children often acquire new skills through song and play, and language acquisition works in a similar way. This app will teach your children simple Chinese vocabulary and sentences with interactive songs. Suitable for children ages 2+, this intuitive app is great for bilingual children on a Mandarin learning journey. This book from Lonely Planet Kids is perfect for the whole family, featuring 100 useful words to use whilst travelling, from food and transport to animals and weather. 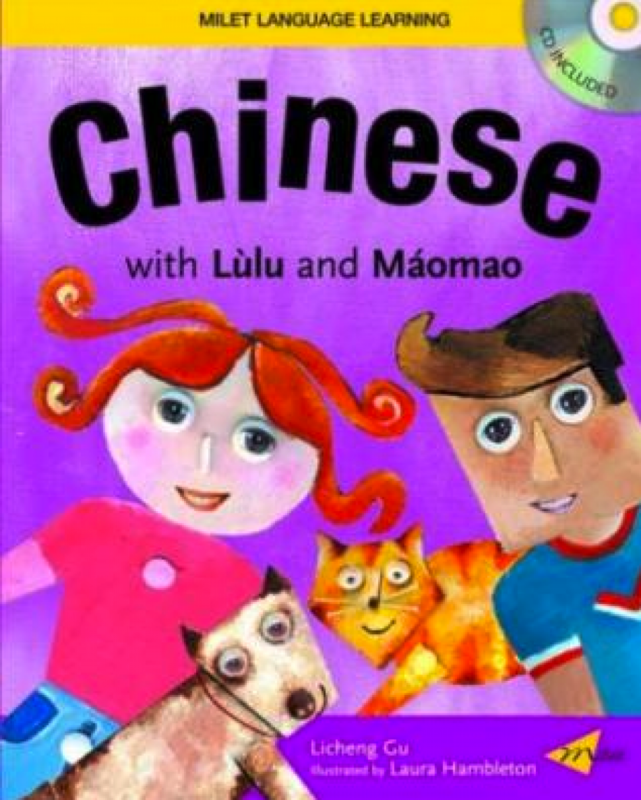 Chinese with Lulu and Maomao brings a fresh approach to language learning, with the added bonus of a CD to give an extra learning dimension. 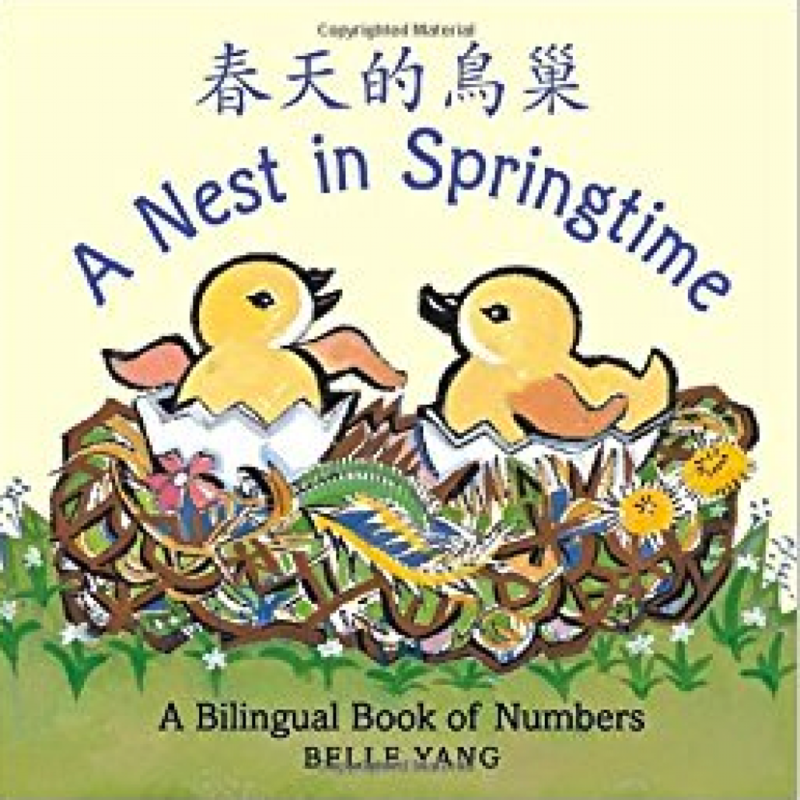 Designed like a storybook, as opposed to a traditional textbook, giving children a stimulating foundation to Chinese and covers topics that will appeal to young learners, such as family and friends, school, toys and games, numbers and colours. In springtime, when wild geese come to nest, there are eggs for counting. But how many goslings will there be? And how many in the whole paddling family, when Papa and Mama join them? Tonal marks used in the book are explained in a final spread, along with a pinyin translation of the Chinese characters. This enchanting picture book opens the door to an important part of Chinese culture to children. Follow a family as they celebrate Chinese New Year, watch their lanterns sail into the night and be mesmerised by the dancing dragon.